With release 0.9.4, Macaw platform supports microservice provisioning to environments backed by Kubernetes cluster. 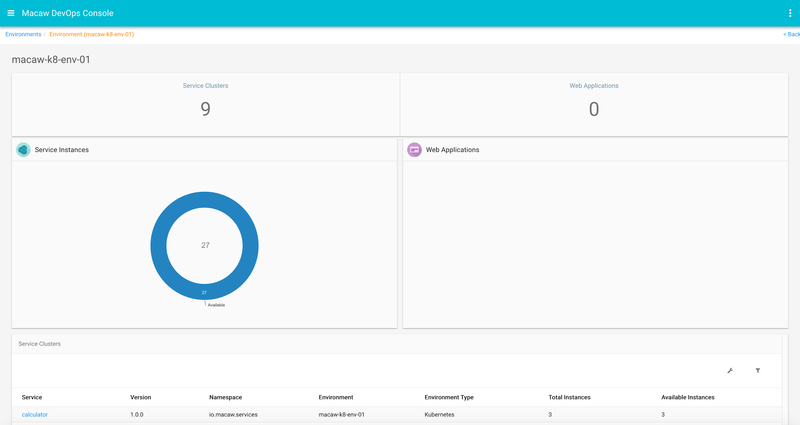 Macaw Service provisioner leverages the Kubernetes deployment declaratives to orchestrate the seamless creation and management of service pods. Below are the high level features supported by Macaw platform release 0.9.4 w.r.t Kubernetes environment. Ability to provision Service Blueprints into environments backed by kubernetes cluster. Macaw Service Provisioner interacts with the Kubernetes master either with basic-auth or token based authentication. Ability to view Service clusters/pods in Macaw Console. Ability to scale up and scale down a service cluster. 6. Rolling update of a service cluster with a new image. Implicit support for Macaw features like Metrics, Events, Elasticsearch Log integration.